A MLM was held during the Spa Euro Race + Procar Trophy on the Spa-Francorchamps circuit the weekend of the 4th through 6th of June 1999. 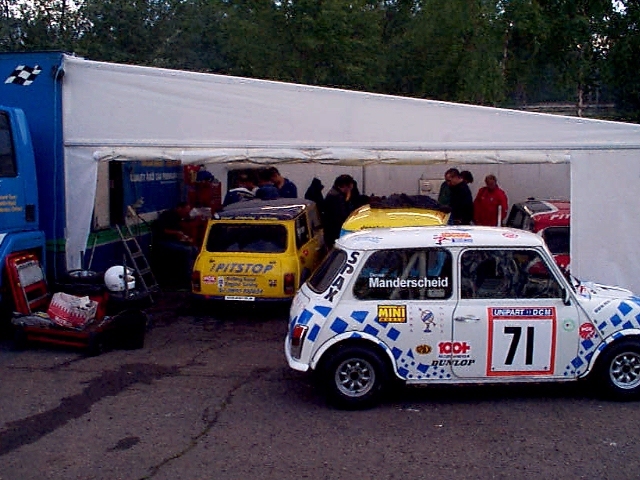 The Unipart DCM races were on that weekend and listers Tom Francis and Paul Hampton were racing. Following is a report of said weekend. If you want to skip te report, go directly to the pictures. On Friday the 4th I drove to Francorchamps via Koln. In Koln I collected Steve Dix and we drove on to Francorchamps. We were a bit early for the first set meet so after making sure we could reach the agreed meeting point we went on to the apartment in Vielsalm to drop of our stuff and then returned to Francorchamps. Although Henk Burgler had told me he would be there on Friday we didn't see him at the meetingpoint, nor in the bar close by. We walked down to the circuit and saw the first practice/qualifying rounds of the Mini's. The Miglias and Se7ens (1300's vs 1000's) were going to race at the same time so at practice there were over 60 Mini's on the track. We were at the hairpin and saw the different drivers test ways to get through the corner as fast as possible. The results of that session can be found at the Spa Euro Race site's results backup-page here. We then went on to meet Tom and Paul in the paddock. Although Tom had finished last and Paul 23rd in class it turned out both were having problems, but Paul much more so than Tom. Paul had an on-board camera and he showed us the footage on which you could distinctly hear something going wrong. When Paul removed his rockercover it became apparent quickly that indeed something had gone wrong. One of the washers holding up the valves had broken. So it was decided that the head had to come off. 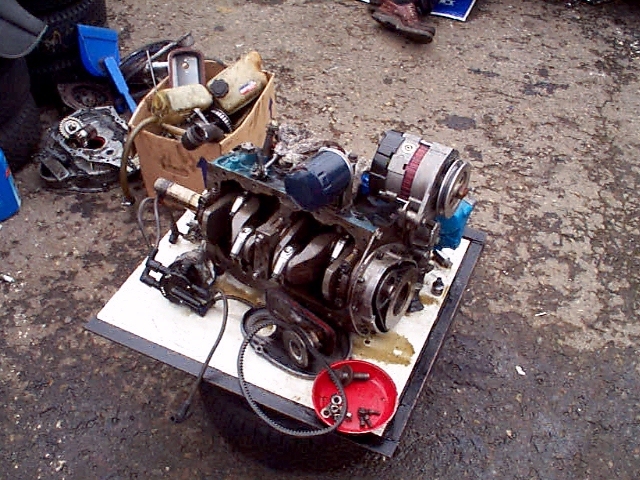 When it did, with help from Tom and his dad, it showed a bent valve and some markings on the piston. Since they didn't have a spare valve with them Paul sourced one from one of the other teams. At further inspection though it turned out that not only had the valve been bent, but the cam-follower also had been crushed which meant an engine-out-job. Given that they had to work completely uncovered and the weather at Francorchamps Paul was happy to accept the offer of the use of a canapé of their neighbors. Next to Tom and Paul the Letts brothers had 'set up camp' and were having troubles of their own. At T&P (or was it P&T ? :) Racing it was decided that since neither of them had had any sleep since Thursday-morning they should call it a day and start freshly in the morning. So we headed for the pub together with two other drivers; John Pearson (AKA Frank) and Con McLauglin (AKA Dr. Bas'tard). On Saturday we (or at least I :) got up around 10. After we were about ready Andy ('from Belgium') showed up in Stimpy. He dropped of his gear and we went down to have some breakfast. I got a call from Christiaan (AKA CMC) who was in Francorchamps looking for the meeting point. I directed him there and told him we'd be there in about an hour. So the four of us got in Stimpy and drove down to Francorchamps again were we met CMC. Andy had arranged a bunch of Guest-tickets which gave access to about everything but the track and paddock. We met up with Tom and Paul in the paddock again, were Tom was getting ready for the second practice round/qualifying. If you really look hard you can see Tom driving by, just behind the pitwall. The results of that second session can be found at the Spa Euro Race site's results backup-page here. Paul was having better luck. Instead of having to do the full engine-out-job himself, possibly in the rain, with just a basic toolset, the people from Pitstop Racing made him an offer he just could not refuse. 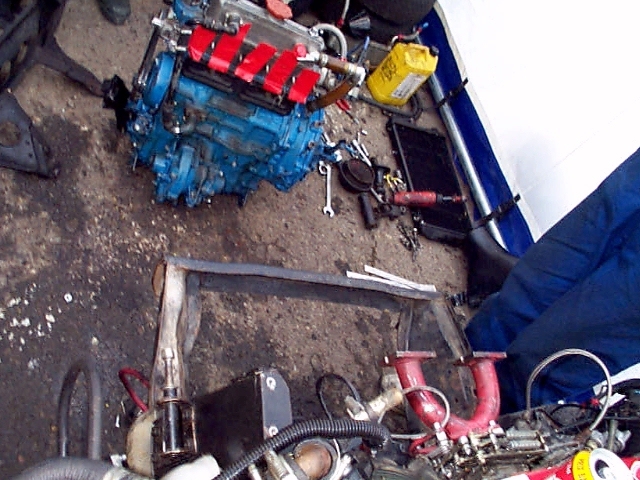 They helped him getting the engine out in their pit, also using their tools and offering some of their spare parts. When the engine was taken out it showed that even more damage had been done. Apparently the washer had broken, the valve thrown up by the piston, which drove the pushrod down at a wrong time, crushed the cam follower, damaged the cam and the bits and pieces fell down on the gears marking some of the teeth. The piston was in good enough shape to last the race, as were the gears, but the rest had to be replaced. Of the other contenders neither 'Dr. Bas'tard', 'Frank' nor the remaining Letts brother Geoff were very pleased with their result. Geoff slipped from 8th to 11th place in class. He did find that one of the rear-camber brackets had given in and was confident that fixing that would stand him a better chance of ending in the top 10 which was the lowest result he would be satisfied with. 'Frank' went from 14th to 19th and consequently wasn't to happy with his result either.'Dr. Bas'tard' went from 19th to 21st and was having problems with his braking system all weekend, which doesn't help much in corners like the bus-stop were a lot of car went off the track during the weekend. 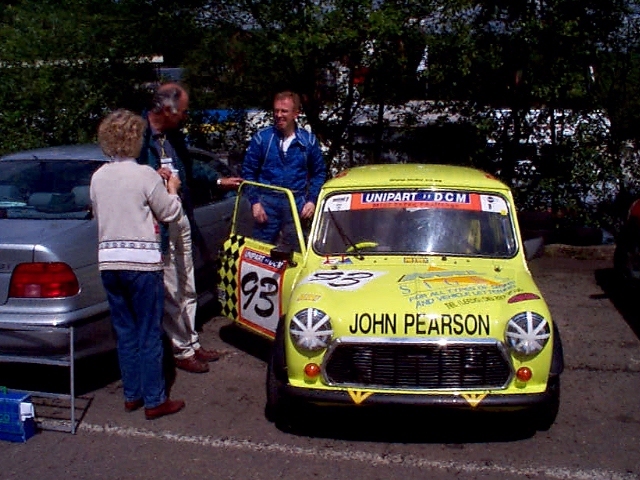 Inspection and analysis of Tom's Mini showed that the bearing of the #2 cylinder had gone. Plans were construed on fixing it, non of them were thought to be viable though, so in the end Tom made the decision to forfeit the race. 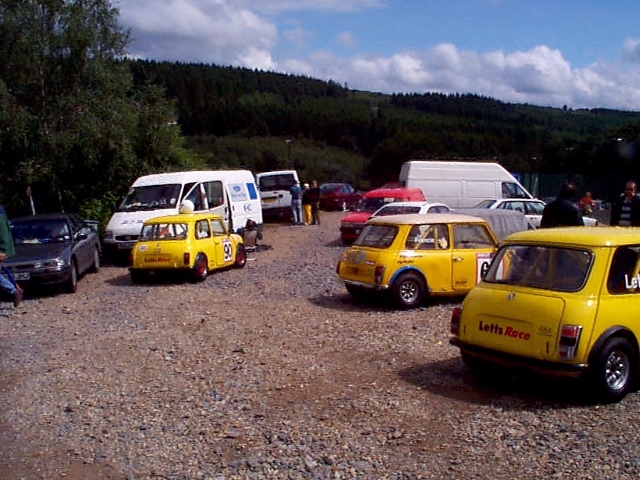 Didn't seem like this was a good event for yellow Mini's with both Tom's and Allan Letts's Mini now out of the race. Henk, CMC, Andy, Steve, ??? 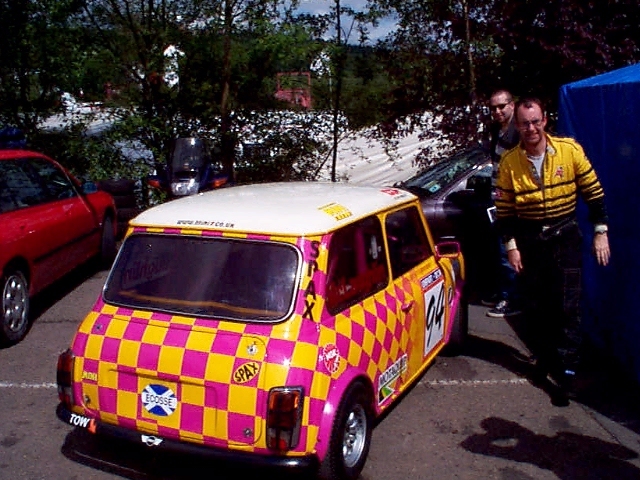 Which meant all the attention and energy of T&P Racing could be focused on Paul's Mini. Unfortunately though work didn't progress much on it because Pitstop racing in the mean time had gotten a few problems of their own that took all of their attention. One of their star-drivers (of which they had a couple :) #60 had been involved in an accident. 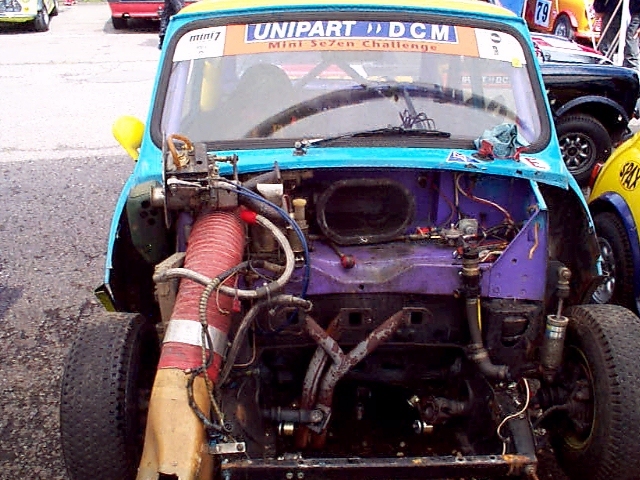 The subframe was damaged which meant it had to be replaced. Unfortunately there was only a subframe for an automatic at hand, and as anyone who knows something about Mini-subframes they're not the same. But that didn't stop them from trying and in the end they succeeded in getting it to fit. 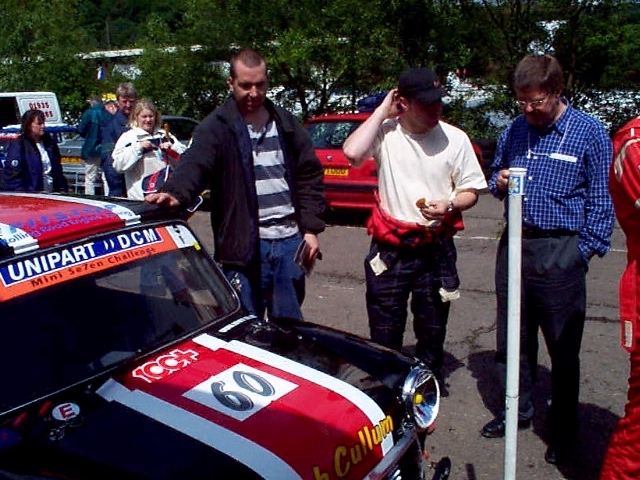 This meant that T&P Racing had to do the work themselves and luckily for Paul some of the MLM-ers attending have a vast experience with Mini and thus could lend a hand. Those who were less experienced helped out by running arrons for beer and food and standing out of the way as much as possible. 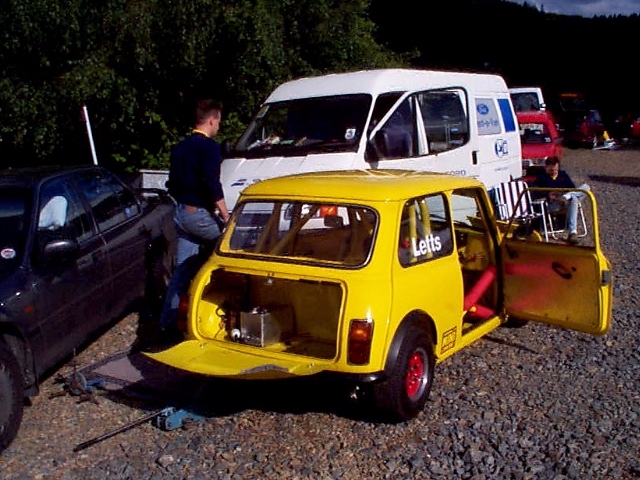 There even was a surplus on experience so CMC (who takes Mini's apart in his sleep :) and Henk (who races karts and is planning on putting a Mini racer together) could take a closer look at 'Dr' Bas'tard's Mini racer. 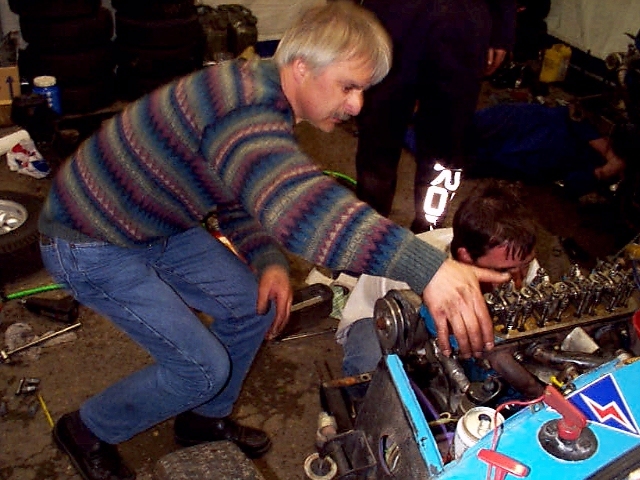 In the mean time it were mostly Tom and Andy who got their hands dirty putting Paul's Mini back together. And surprisingly at around 1am it started and first try. Paul was back in the race. And on it went into the paddock again to see Paul off for the actual race. The engine held out just fine and Paul (technically ?) finished 23rd in class. He did have an incident in the last lap in the busstop though so we didn't actually see him get the checkered flag. 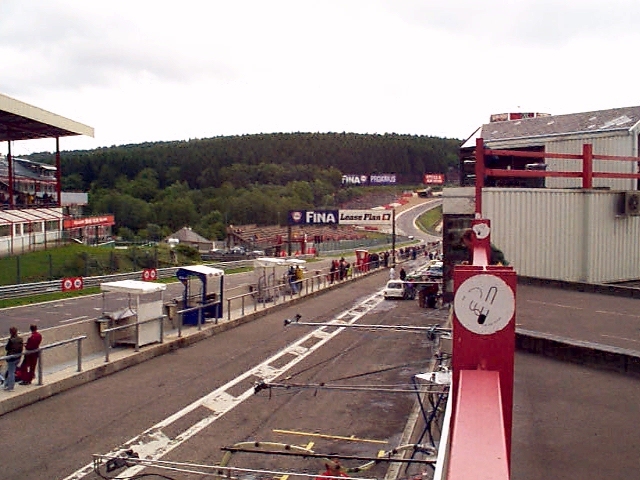 The results of that session can be found at the Spa Euro Race site's results backup-page here. AFA the other drivers go Geoff Letts stayed in front of 'Dr. Bas'tard' but finished two places behind 'Frank'. All three seemed maybe not happy, but given their starting positions and how they had been doing the rest of the weekend pleased with the endresult. Andy had to leave to go back to work and Steve, CMC and myself helped T&P Racing packing for the trip back home. CMC left and Steve and I returned to the apartment to get some more sleep which we, being as old as we are :), desperately needed. On Monday we checked out and since part of the circuit is public road (basically from Stavelot till Les Combes) I drove a 'round' on it before dropping Steve off in Koln again. Enjoyed playing with the big boys on the German Autobahn back home, dropped off my gear and went on to work. The end of what had been a great weekend at the races. I'd like to thank all the racers and pit-crew we met during the weekend. I know how irritating it can be to have a bunch of spectators around, but they all were very friendly and helpful and simply a nice bunch to hang out with. Here are all the pictures as they are shown above, in chronological order.